The Nobel Prize was established by the will of the Swedish chemist, engineer, inventor, businessman, and philanthropist Alfred Nobel. During his lifetime, he amassed great wealth through his numerous inventions (of which the best known is dynamite), investments in oilfield exploitation, and more than 90 armament factories. In 1888, a French newspaper erroneously published Alfred Nobel’s obituary, confusing him with his elder brother Ludvig who had died while visiting Cannes. The obituary condemned Alfred for inventing dynamite, which made him think about leaving a better legacy after his death. In 1895, Nobel signed his last will and testament, setting aside the bulk of his estate to establish annual prizes that would recognize significant cultural and scientific advances. Alfred Nobel passed away on December 10, 1896. On June 29, 1900, the Nobel Foundation was established to manage the finances and administration of the Nobel Prizes, and the first ever Nobel Prize ceremony was held in 1901. The first laureates were Jacobus Henricus van 't Hoff (chemistry), Emil Adolf von Behring (physiology or medicine), Sully Prudhomme (literature), Henry Dunant and Frédéric Passy (peace), and Wilhelm Conrad Röntgen (physics). 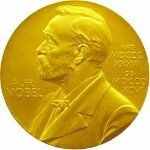 According to Nobel’s will, the prizes are awarded for significant achievements in physics, chemistry, physiology or medicine, and peace. Since 1969, the central bank of Sweden has sponsored the Nobel Memorial Prize in Economic Science. Commonly referred to as the Nobel Prize in Economics, its laureates are honored at the same ceremony as the Nobel Prize laureates. Nevertheless, it is not a “true” Nobel Prize since it wasn’t established by Alfred Nobel in his will. The Nobel Prize ceremony is held every year on December 10, the anniversary of Nobel’s death. The majority of the Prizes are presented in Stockholm, Sweden, but the Nobel Piece Prize recipient (or recipients) is honored in Oslo, Norway. Each laureate receives a gold medal, a diploma, and a sum of money depending on how much money the Foundation can award each year. The prize cannot be shared among more than three recipients, and the award is never given posthumously. Each of the award ceremonies is followed by a banquet. The bigger and more lavish banquet is held in the Blue Hall at the Stockholm City Hall. It is attended by 1,300 guests (including the Swedish Royal Family) and 200 students. The Nobel Peace Prize Banquet is hosted by the Oslo Grand Hotel. It is attended by about 250 guests, including the laureate or laureates, the President of the Storting (parliament), the prime minister, and the King and Queen of Norway. On December 11, the Nobel Peace Prize Concert is held in Oslo. It features performers from different countries and a wide range of musical genres. Past performers have included Sinead O’Connor, Mariah Carey, Alanis Morissette, Enrique Iglesias, Phil Collins, Sting, Tina Turner, Paul McCartney, and other notable artists.